Cobb says the average chimp survives 25 to 35 years in the wild and 35 to 45 years in zoos. Could a chimp really be 80 years ago? R.D. Rosen produced a lengthy article in The Washington Post raising doubts about at least one other ‘Cheeta’ and its owner’s claims to Hollywood credentials. Cobb says Cheetah came to the sanctuary from the estate of Johnny Weissmuller, former American Olympic gold medal swimmer who played Tarzan in the 1930s. 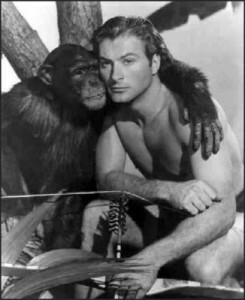 Cheetah played Tarzan’s comic sidekick from 1932 to 1934, the sanctuary tells WTSP. Ron Priest, a sanctuary volunteer for seven years, tells the newspaper that Cheetah stood out with his ability to stand up and walk like a human, with shoulders tall, and back straight.